Hello my pretty Owls! 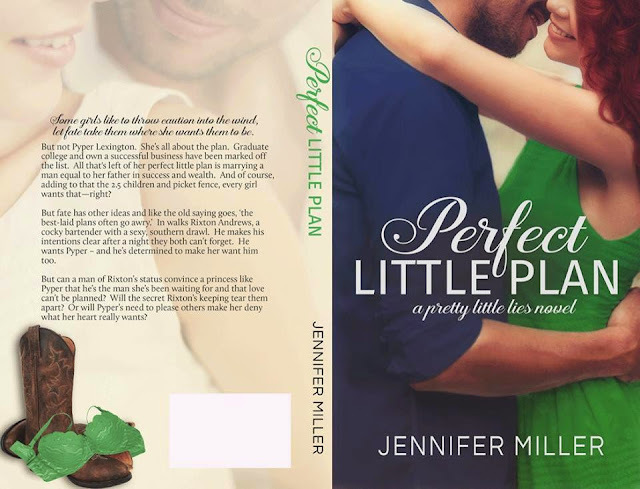 Today is an exciting day; it's the release day of Perfect Little Plan, book 3 of Jennifer Miller's series, Pretty Little Lies! I am so happy we get to read Pyper's story next. If you are new to this series, no worries! I am giving away e-book copies of the first two book, Pretty Little Lies and Pretty Little Dreams to one lucky winner! The winner will be picked a week from today! Some girls like to throw caution into the wind, let fate take them where she wants them to be. But not Pyper Lexington. She’s all about the plan. Graduate college and own a successful business have been marked off the list. All that's left of her perfect little plan is marrying a man equal to her father in success and wealth. And of course, adding to that the 2.5 children and picket fence, every girl wants that—right? I didn't get any new books for the holidays - but I did get a Kindle!!!! Oh God, I one-clicked too many to name!